We’ve been so busy with another project this year that I could only make it back for about three weeks in July. I needed to repair some gutters that got damaged in the heavy snow and ice the past winter and also install or have installed snow guards on my steep roof. I should have had them done when they put the new steel roof on, but the guards are a little ugly and I was pinching pennies. Waiting wasn’t a total loss, though. Since last year, the roofing company I used have changed the style of snow guard they use to a rail type — it had been the individual metal spike style before. I think the rail style will look better on my roof. Also on this trip I needed to continue working on the second story where two rooms and a closet still needed drywalling. 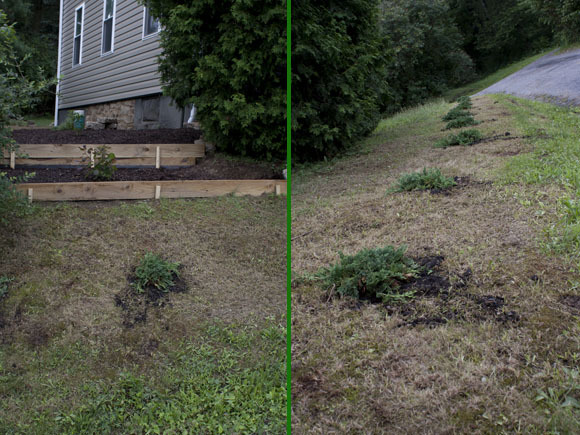 And finally, I wanted to do some quick, low-cost landscaping to neaten the yard around the house a bit and cut down on the amount of mowing necessary, particularly on the bank beside the house. 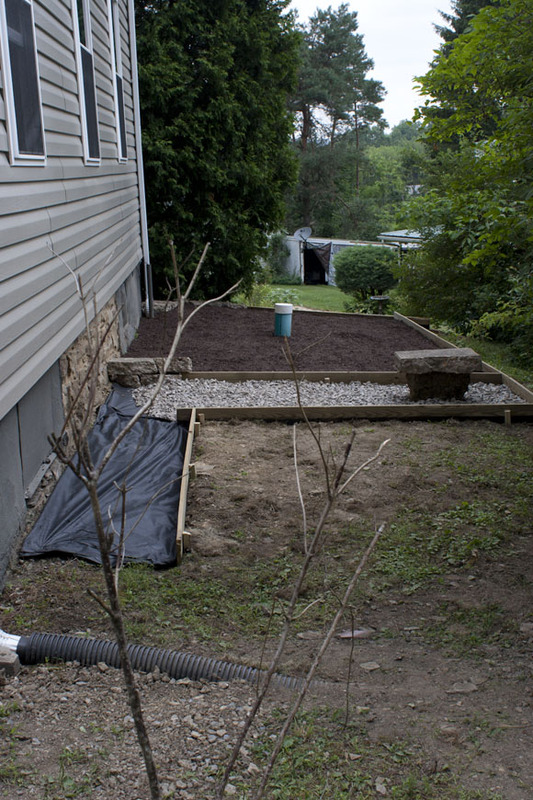 Here I’m beginning a small terrace. The black plastic is down temporarily to kill the grass beneath. I leveled the main area on top leaving a slight grade down and to the left side of the house were the water naturally drains. Terrace finished. I used treated pine at a slight angle held with stakes. They are mostly cosmetic. On the right you can see the young Blue Rug Juniper that I hope will someday cover the entire bank. I will put weed barrier down around them until they begin to overtake the grass. 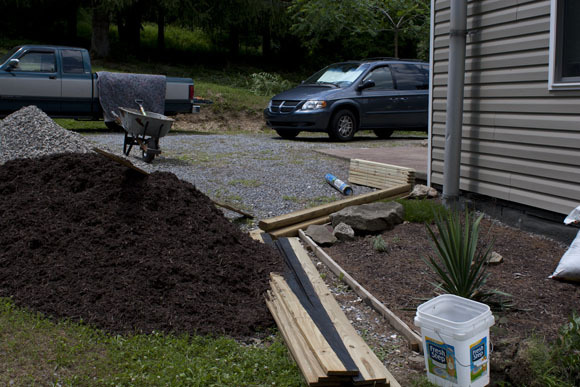 Materials for my no-frills landscaping: Treated lumber and about two tons each of gravel and mulch. Outlining my path. 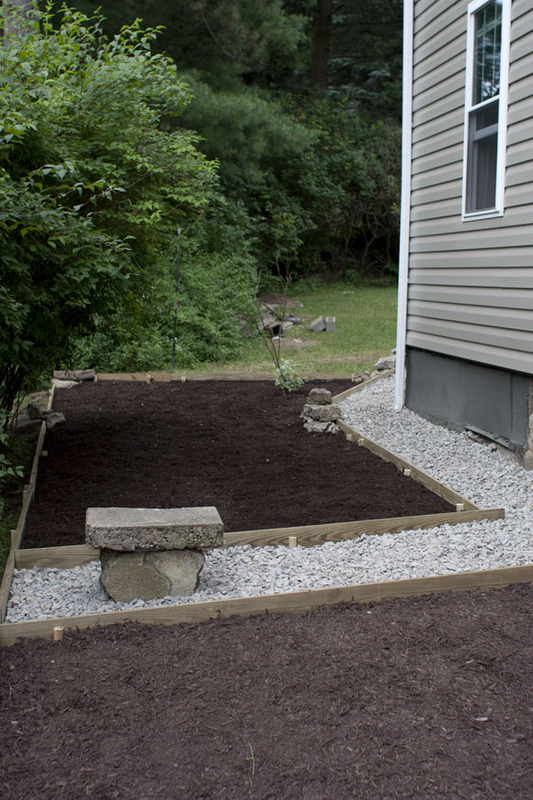 The section of gravel that bisects the mulch aligns beneath the center window of the house. No one will ever really see that, but it just seemed to make sense. Nearly done. I’m going to keep it pretty sparse for now. I added a couple lavender bushes after this photo was taken. 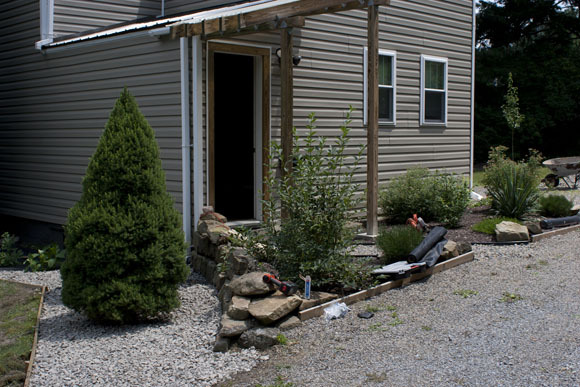 I was using up the broken concrete slabs that were collected when we excavated the old front and back porches, which you can see in the siding post. 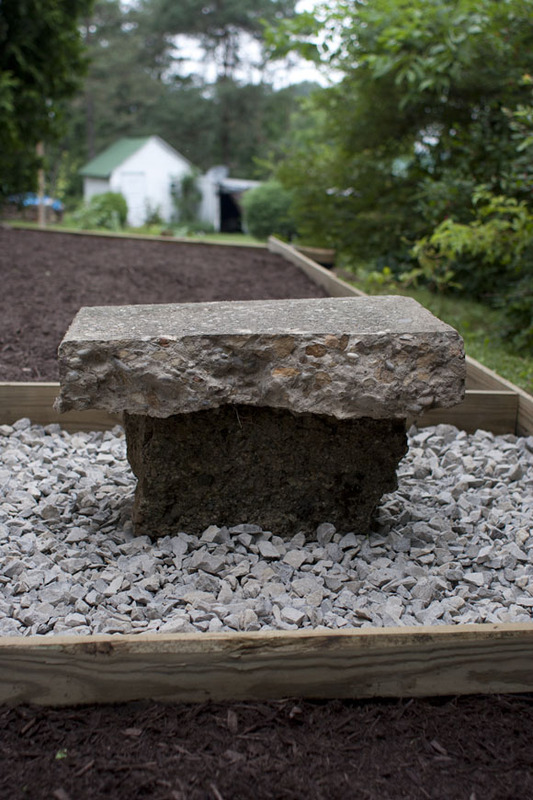 I placed them in the corners of some of the edging and also made this simple but sturdy little bench. 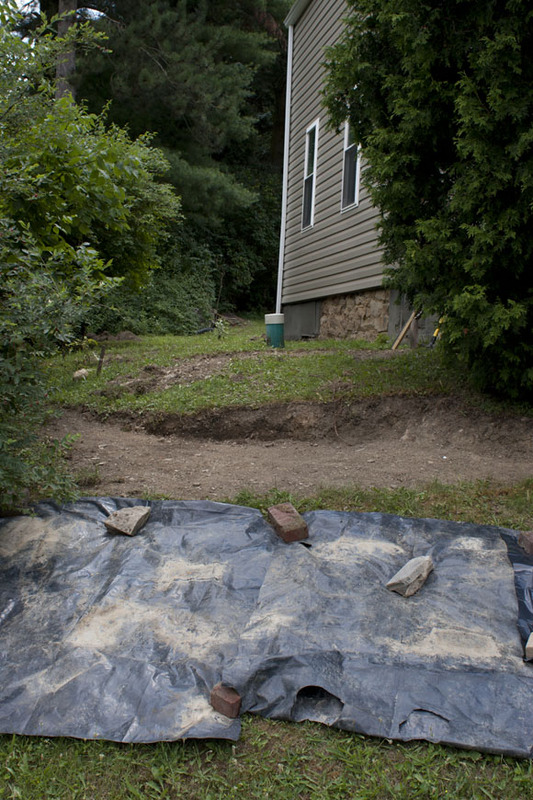 Here’s some more gravel area added to the side of the house above the juniper bank.